Mommy Maestra: Curious George: A Halloween Boo Fest! 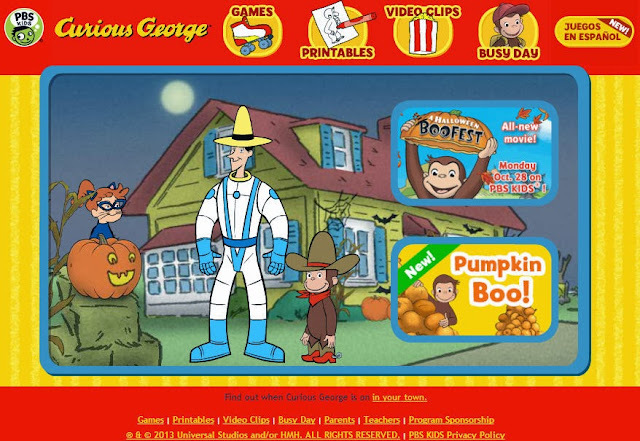 Curious George: A Halloween Boo Fest! Courtesy of CG ® & © 2013 Universal Studios and/or HMH. All Rights Reserved. Oh, come on. Who hasn't thought of the Man in the Yellow Hat as just a giant platano (banana) anyway? This coming Monday, the first-ever Curious George Halloween special, CURIOUS GEORGE: A Halloween Boo Fest!, premieres on PBS KIDS. The one-hour special features three original songs, including “It’s Halloween Today,” sung by Pat Monahan, the lead singer of Train. It’s George’s first Halloween in the country, and Bill tells him and Allie about the “Legend of No Noggin” – a spooky tale about a hat-kicking scarecrow who haunts the countryside on Halloween. But is the legend real? George and Allie are determined to find out by taking a picture of No Noggin in hat-kicking action. But first, George needs to figure out what he’s going to be for Halloween so he can win the costume contest at the town Boo Festival and give the prize to the Man with the Yellow Hat. Will George be able to put together the perfect costume and find out the truth about No Noggin? Only the curious will find out! In fact, this episode kicks off a whole week of Halloween-themed programming on PBS KIDS. You'll just have to watch and be surprised about all the holiday goodness! And of course, in true PBS KIDS fashion, because they believe in the power of transmedia storytelling, PBS KIDS has launched a new Curious George online game to accompany the show. In it, your child will use problem-solving and logical thinking skills as he or she explores a pumpkin patch with George, encountering playful spooky surprises along the way. It's cute. My son, who loves all things George even though he is 7, loved it. The site even features games and free printables in both English and Spanish (another reason I love PBS KIDS). Disclosure: I'm a PBS KIDS Ambassador. I was not, however, compensated for this post, but received information about the new episode. All thoughts and opinions expressed above are completely my own!